Well, its not easy to know precisely, but many historians ascribe the earliest picture postcard to a Brit — Theodore Hook — who mailed the card to himself in 1840. Hook, a prolific writer in his day (1788- 1841) was considered to be a man of letters, although his most enduring legacy may have been the invention of the postcard. It’s a humorous irony that might not have been lost on Hook himself, who was also known for his tomfoolery and pranks (more about this below). The postcard he created, likely as a joke, included a caricature of post office workers around a gigantic ink well. The reverse side included Hook’s address at Fulham in London, and a Penny Black stamp in the upper right corner. Among Hook’s other achievements was the Berners Street Hoax, based on his bet that he could turn any house in London into the most talked-about address within a week’s time. Hook busied himself by sending thousands of letters (not postcards) and invitations in the name of Mrs. Tottenham who resided at 54 Berners Street. On November 27, Berners Street became packed with chimney sweeps, delivery carts, cake makers, doctors, lawyers and priests. Several pianos and organs were delivered. And many dignitaries arrived, including the Duke of York, the Governor of the Bank of England, the Lord Mayor of the City of London, and the Archbishop of Canterbury. By day’s end, hundreds had made their way to 54 Berners Street, much of London became frozen in gridlock and Hook won his bet. Alas, the postcard received its start from such notoriously enveloped beginnings. But since we’re in the postcard business ourselves, we like to think of Mr. Hook’s invention as an example of man’s can-do, creative spirit. Even today, the postcard fulfills its purpose: when you have something big to say, but don’t want to spend a lot to say it. So, thank you Mr. Hook. We make thousands of postcards everyday. They’re made with magnets attached, and sent to a mailing list that our customers provide. Please feel free to visit our postcard magnets website at magnetbyMail.com . What Is the Size of a Postcard in USA? The size of a postcard is 4-1/4 inches high by 6 inches wide, maximum, to be eligible for First Class Mail postcard rate by the USPS. Any larger, and the USPS will call your mail a letter or flat, and charge a higher rate. 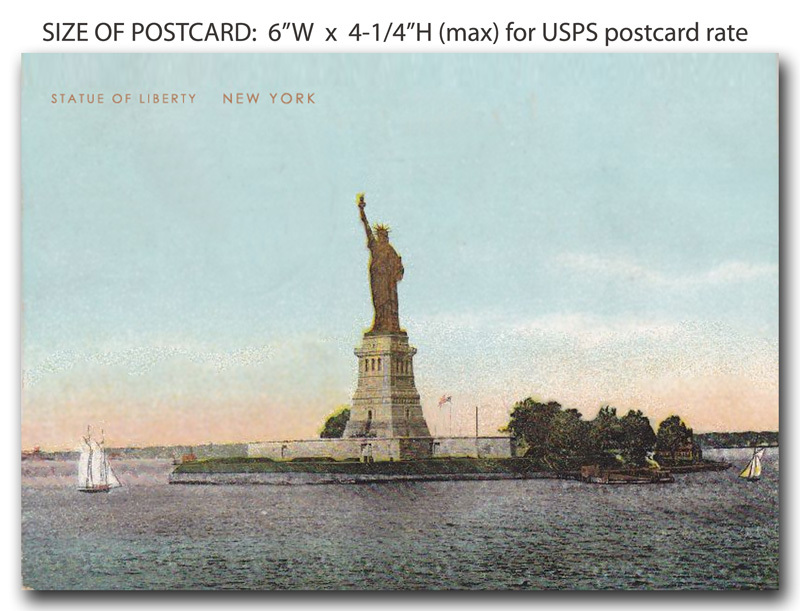 For the USPS, minimum postcard size is: 3-1/2″H x 5″W. Also, the USPS requires that postcards be a thickness of 0.007 inches, minimum; and 0.016 inches maximum. Lastly, the mailing piece needs to be rectangular. It makes sense to design your postcard to meet the USPS standards. The First Class Mail postcard is given a very low rate by the USPS, and receives all the benefits of First Class mail, including mail forwarding and return if addressee not found. A footnote — please note that our Postcard Magnets at magnetbyMail.com are not mailed using US First Class postcard postage. Instead we mail most using rates based on bulk mail. For more info about direct mail campaigns with magnet mailers, check us out at magnetbyMail.com . Or drop us a postcard!